Home » Comparisons » Tuft & Needle vs. Purple Mattress Review: Which Should You Choose? This Tuft & Needle vs. Purple Mattress review will compare the established Tuft & Needle mattress with the new kid on the block – the Purple Mattress. The former is well known as a good lower cost mattress suitable for many different types of sleeper while the Purple Mattress is a new entry into the mattress market. Let’s start with the way each mattress is constructed: the layers involved and why they are used. Both are 100% foam mattresses – no innersprings! Since the Purple Mattress is the newer of the two we are looking at, you would expect it to offer some unique features to help push it ahead of its competitors – and there are many competitors, not only the Tuft & Needle. Here is how the two match up to each other. We begin our Tuft & Needle vs. Purple Mattress review with the layers that make each mattress what it is. The top layer is a 2-inch layer of Hyper-Elastic Polymer™ grid – the grid structure spreads the pressure of your body equally over the whole mattress. Its purpose is to prevent your body weight from compressing a specific area of your mattress. By spreading it around, the mattress will retain its support for much longer. The Hyper-Elastic Polymer™ was developed by Tony and Terry Pierce, the designers of the mattress. The layer below that is 3.5-inches of 1.8 Lb polyurethane foam. This provides a slightly denser base for the top layer so that you do not sink through the top layer to a hard base layer of foam. The third layer is 4-inches of a harder polyurethane foam that provides the main support. 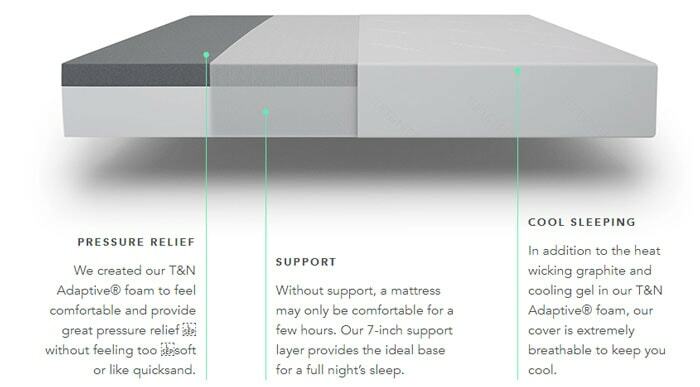 This layer helps the mattress to wear better. Now let’s compare these layers with those that make up the Tuft & Needle mattress. A 3-inch top layer of specialty polyurethane foam with a density of 2.8 lb. This is fairly high, although the foam is responsive to your pressure points. It is also breathable, a property that helps you to stay cool during the night. A 7-inch support layer of standard high-density polyurethane foam. This layer helps keep your spine and neck properly aligned. The objective of the Tuft & Needle team is offer a mattress that is comfortable to a wide range of people with various sleeping positions. It has also been designed to provide pressure relief, and to achieve both objectives without the restrictive sensation that many memory foams can give you. The cover of a mattress is more important than many people might believe it to be. The Tuft & Needle cover is fairly thin and breathable, so allows a good flow air through the cover and the top poly foam layer. It also stretches well for a good fit. The Purple Mattress cover is slightly less thin than that of the Tuft & Needle, so should wear slightly better. Its polyester (69%)/viscose (27%) blend also contains 4% of polyester-lycra blend, giving it good stretch properties and a good level of breathability. It is likely to be more durable than the thinner Tuft & Needle cover. Before making a decision, you have to think about what you want from your mattress. Sure, you may get a ‘trial period’ or be able to return the mattress after a specified period of time. However, it’s always good to get it right first time. No mattress suits everybody perfectly. That’s why we have looked carefully at the Tuft & Needle Mattress and the Purple Mattress. Here is our conclusion on which of the two is more likely than the other to suit people with specific medical or orthopedic issues, people with different sleeping positions and those with other personal needs or preferences. Prefer a mattress with good support – with a medium or slightly hard to medium firmness. On a 1-10 scale, with 1 the softest, then the Tuft & Needle mattress rates around 6.5 on a scale of 1 – 10. You are heavier than average weight: the Tuft & Needle provides deeper core support. You are not too concerned about the foam you sleep on then it is a good choice. By ‘concerned’ we mean if you do not have to sleep on memory foam, or you need not have any other specific type of foam. Prefer a mattress that cools you – the Purple mattress is slightly better than the Tuft & Needle due its grid style of construction with air pockets between an intersecting grid of foam. Prefer a thicker comfort zone rather than just the 3 inches of the Tuft & Needle. This also rates about 6.5 for comfort, though if you are on the heavy side, then you may not like the level of sink. Want a good level of bounce in your mattress. Young couples may prefer the Purple mattress to the Tuft & Needle for this reason. Sleep on your side then the Purple mattress offers a deeper comfort layer and the core strength to support your pressure points. Both provide a polyurethane base layer with excellent support properties. Both are responsive to your pressure points, and offer good pressure relief for your shoulders, hips, lower back (lumbar region), buttocks and other pressure points according to your sleeping position. Both are made in the US. Both have good, stretchable covers, though the Purple mattress is slightly thicker and slightly more durable. Both offer similar 10-year warranties and 100-night trial periods with a full, 100% refund. The Purple mattress tends to keep you cooler at night than the Tuft & Needle, although both are more temperature neutral than a memory foam mattress. The Tuft & Needle mattress is a half-inch thicker than the Purple mattress. The Purple mattress comprises three layers to the Tuft & Needle two. The Tuft & Needle mattress uses a polyurethane foam top layer specially designed to be breathable and offer good support allied to comfort. 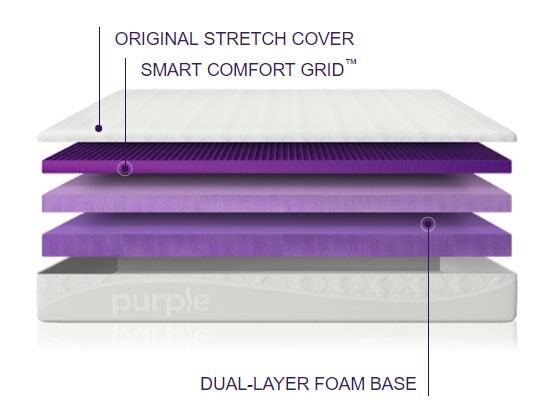 The Purple mattress uses a comfort layer of hyper-elastic polymer gel that absorbs your body heat. The Purple mattress feels like it absorbs your body weight better, but the Tuft & Needle has better base support for heavier weight people. So which do we recommend? We think both has its own positives with very few negatives. No mattress is perfect for everybody and if you feel you have made the wrong choice using the information we have given you, each does offer you the 100-day sleep trial. It’s not easy to choose between two mattresses that are so similar, yet also offer their own specific benefits. Hopefully, we will have given you enough information in our Tuft & Needle Vs. Purple Mattress review to enable you to make a choice based upon the pros and cons of each. The Tuft & Needle mattress and the Purple mattress are both high-quality mattresses. You can’t really go wrong with either.